In Her Eyes It’s Beginning To Look Alot Like Christmas – 6/7 Month Update! Hello everyone! My son Elijah was born almost 2 months ago and right away the doctor mentioned a possible chromosomal disorder, so the possibilities have been weighing on me for a while now. However, we finally received his diagnosis of WHS on Monday of this week. I’ve been researching all I can and I’ve read so many of your stories through teary eyes. I know that so many of you have said that the size of the deletion doesn’t matter as much as where the deletion is, but I’m really trying to compare stories and prepare myself for what we may face. So far I have been unable to find anyone with a deletion as large as his…he has a 15 MB terminal deletion from 15.33…so he’s missing everything from 15.33 to the end of the arm. Are there any families out there with a deletion similar to this? I’m just looking for some hope…thank you all for your help! Welcome! My son Tyler has a deletion size of 14.91 mb. I’m not sure of the exact location, I would have to get out his chromosome analysis but what you have heard is correct. Deletion size doesn’t matter and there are so many factors that go into it. A great thing going for you is a early diagnosis. We have some friends who didn’t the diagnosis for years and their children are still thriving. It’s great that you can start therapy and remedy symptoms associated with syndrome earlier rather than later. You can find many of us on Facebook and we are a loving helpful group. Ask questions and get a support group of people who have been there. Good luck!!! Welcome to our family! 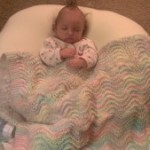 We were given Caroline’s diagnosis when she was 1 month old. She doesn’t have a very large deletion, but I agree that the getting involved in therapy and EI services early is a big help. And the Facebook community is amazing. If your a member of Facebook I encourage you to join the private group. I have been able to go there with so many questions and get answers almost immediately. It’s also a great place to be able to share, and see the progress of other kids, which is always encouraging! Try not to get to discouraged with the information out there on the internet. When we were given Caroline’s diagnosis the only information we were given was from over 10 years ago, and when I got home and Googled it I was very discouraged. But reading the real life stories on here has definitely brightened my outlook on everything. Oh and I love your son’s name! If Caroline had been a boy that would have been her name! Just wanted to let you know I have a son with a rare chromosome deletion (1q22 to 1q24). He has had a lot of health problems. 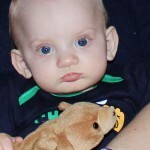 He has reflux(gord), and he started having seizures at 2 mths, became epileptic after a year. He started smiling at 5 mths and he struggled to gain weight. He has just recently starting sitting, but he can’t sit up him self from a lying position. He had just started to reach out for objects and rolls over on his sides. He bares weight through his legs with adult support. He also has sleeping difficulties.he can’t talk or walk yet, he smilies and giggles when you talk to him, he has development delays. This is the first boy in our family in 35 years yet soooo Speacial, he is very hard work but only Speacial people get the Speacial children and I know my little one will do everything that a normal child would do but in his own little speed well done Amaan mummy loves you. Hope this helps you and don’t feel too down. Just wanted to let you know that things will be ok. Yes, i know of a child who actually has a larger deletion (from somewhere on 14 and onward) and he’s doing quite well. ANd it seems a lot of kids have deletions from the 15 point onward. There’s really NO way to compare our kids, and deletion size won’t tell you much about what they will do or what your lives will be like. I know that’s hard to hear/internalize, as it’s natural to compare, measure, try to determine the future. But it’s amazing how different our kids are, and there’s not much more to do than to just let your child show you the way. Deletion size is a very frustrating topic. I think everyone here could tell you exactly how large their child’s deletion is (Frank’s is 4.2MB) because we’ve pretty much memorized and internalized and obsessed over those details, but it really doesn’t serve as a good predictor. If you’re looking for hope though, you’ve come to the right place. This website is a great resource. Also Autumn mentioned above making contacts on Facebook. This website has a great Facebook page associated with it. You can also check out the 4p- support group, which also has a lot of great resources, including an upcoming conference next summer in Pennsylvania. The conferences are a great way to meet children and adults with 4p- and their families. I think you will be comforted and reassured by what a great group of people this WHS community is and how beloved our children are. Congratulations on the birth of Elijah and welcome to a group you didn’t choose to join. The diagnosis is still very new to you, and trying to figure out what it will mean for your family will be tricky. WHS, like life in general, is unpredictable. There are so many variables. Hope for the best, and be prepared to be surprised. Hi! I am mom of Elise who is now 15 months old. Elise’s deletion is at 15.31 with 18MB missing. She has a very large deletion. She doesn’t do much but I think it has a lot to do with her Seizure medication. At one point she was smiling and rolling over from front to back and back to front. She is fed by g-tube because she has excess secretions and doesn’t like to each more then 5 bites. Every child is different as you will see. If you have Facebook there is a group with many of the families of the Wolf Hirschhorn children and adults.